"There seems to be a mysterious link between the amount of dark matter a galaxy holds and the size of its central black hole, even though the two operate on vastly different scales," said Akos Bogdan of the Harvard-Smithsonian Center for Astrophysics (CfA). The research, released in February of 2015, was designed to address a controversy in the field. Previous observations had found a relationship between the mass of the central black hole and the total mass of stars in elliptical galaxies. However, more recent studies have suggested a tight correlation between the masses of the black hole and the galaxy's dark matter halo. It wasn't clear which relationship dominated. "In effect, the act of merging creates a gravitational blueprint that the galaxy, the stars and the black hole will follow in order to build themselves," explains Bogdan. The research relied on data from the Sloan Digital Sky Survey and the ROSAT X-ray satellite's all-sky survey. 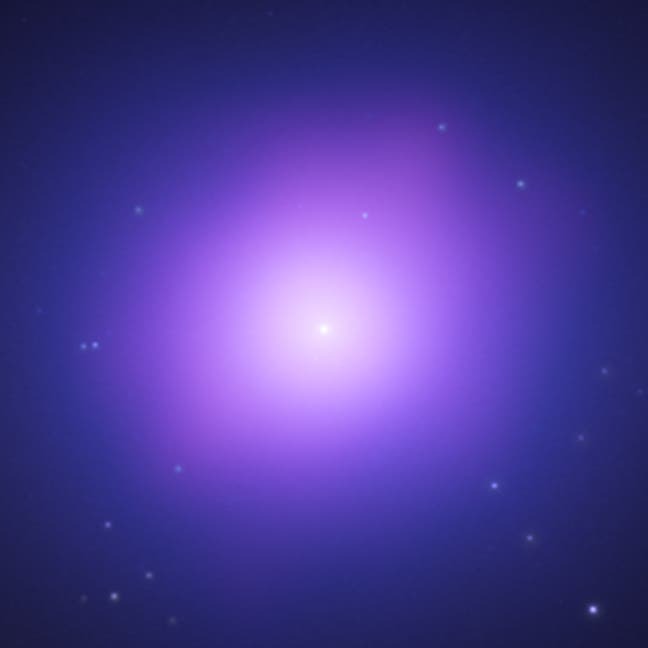 The image at the top of the page is a composite image of data from NASA’s Chandra X-ray Observatory (shown in purple) and Hubble Space Telescope (blue) of the giant elliptical galaxy, NGC 4649, located about 51 million light years from Earth. Although NGC 4649 contains one of the biggest black holes in the local Universe, there are no overt signs of its presence because the black hole is in a dormant state. The lack of a bright central point in either the X-ray or optical images shows that the supermassive black hole does not appear to be rapidly pulling in material towards its event horizon, nor generating copious amounts of light as it grows. Also, the very smooth appearance of the Chandra image shows that the hot gas producing the X-rays has not been disturbed recently by outbursts from a growing black hole. Hercules Supermassive Black Hole –"Lights Up One of the Brightest Objects Beyond the Milky Way"